John's Blog › Holy CRAP! The radio works! Those of you who are truly fans (OK, all one of you) might remember that I asked for a radio kit (the Rock-Mite) for Christmas. Well, my brother-in-law Art drew my name in the Secret Santa list, and bought the thing for me. I had some time off between Christmas and New Year’s, and I built it. 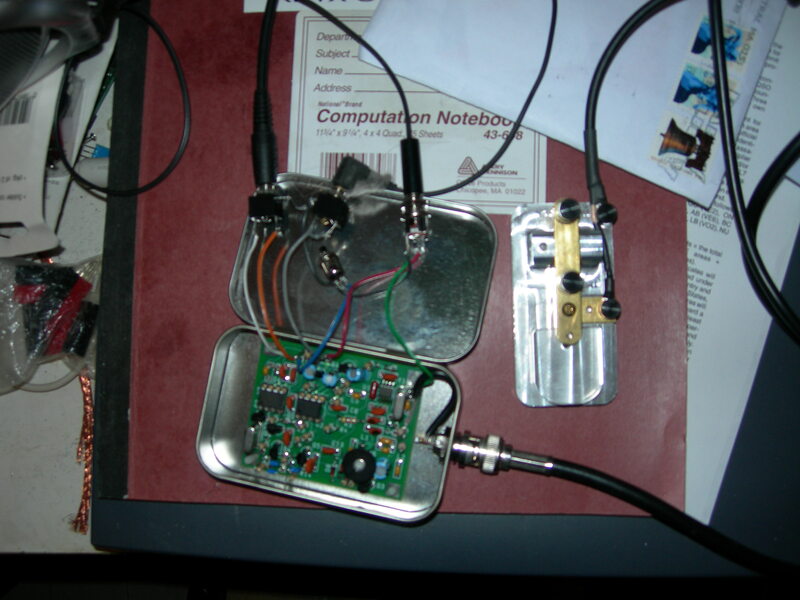 It’s finally encased in an Altoids tin (the preferred radio enclosure for the QRP crowd), and it actually works! I haven’t made a contact on it yet, but it does put in a booming signal to my “big” radio, an Icom IC-756Pro. I even bought it a toy – That aluminum block to the right is a KK1 “straight key” from American Morse Equipment which also came as a kit. When I get a few bucks ahead in my “war chest” I’m planning to buy the KK2 paddle kit to go with it. This isn’t to say that I really know Morse Code all that well, but I’m practicing and getting better. This was written by admin. Posted on Tuesday, January 8, 2008, at 5:32 pm. Filed under Ham Radio. Bookmark the permalink. Follow comments here with the RSS feed. Post a comment or leave a trackback. I just ordered my own rockmite…for 80 meters, also plan to get the same key that you have…we will have to QSO RM to RM some night after i finish my rig!